So, I had to make a run to the Post Office yesterday, and there just happens to be a great little Thrift Store right across the street from the Post Office. As much as I hate going to the P.O., I sometimes allow myself a little diversion over there to take the pain out of the trip to said P.O. The prices are really, really reasonable. And they are always putting new things out, so you never know what you may find. And, as I walked up to the door they had a sign announcing 1/2 off ALL prices! What? All for just $.86! That's eighty six cents people!! I was able to pay for all of it with the loose change at the bottom of my handbag! You can't even buy ONE button at Joann's for 86 cents! 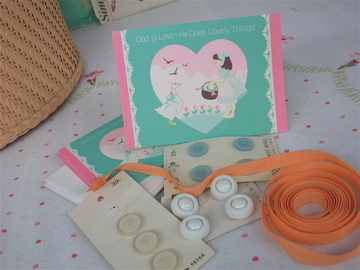 The little note cards say, 'God Is Love - He Does Lovely Things'. Yes He does! There are eight of them, and I think they are oh-so-cute! A very worthwhile trip out even if I did have to go to the stinkin' P.O.! 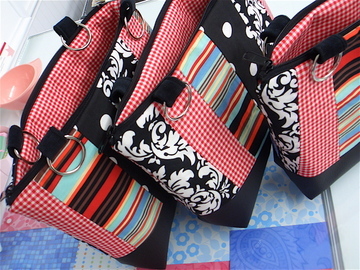 (By the way, I have mailed packages all over the world, but yesterday, I sent a package to Norway for the first time. Not sure why, but it just makes me happy when I get to send a package off to a 'new' country that I haven't shipped to before). Where I'll Be - Come See Me! Thursdays through Sept. 4th, 10 a.m. - 3 p.m.
Saturdays, April - Sept. 5th, 9 a.m. - 2 p.m.
Saturday July 4, 9 a.m.- 5 p.m.
Friday July 17, 9 a.m.- 7 p.m.; Saturday July 18, 9 a.m.- 5 p.m.; Sunday July 19, 9 a.m.- 5 p.m.
Saturday, August 1, 10 a.m. - 5:30 p.m.
Fri. Nov. 6, 9 a.m.- 5 p.m.; Sat. Nov. 7, 9 a.m.- 4 p.m. Sat. Nov. 14, 9 a.m. - 5 p.m.; Sun. Nov. 15, 11 a.m. - 4 p.m.